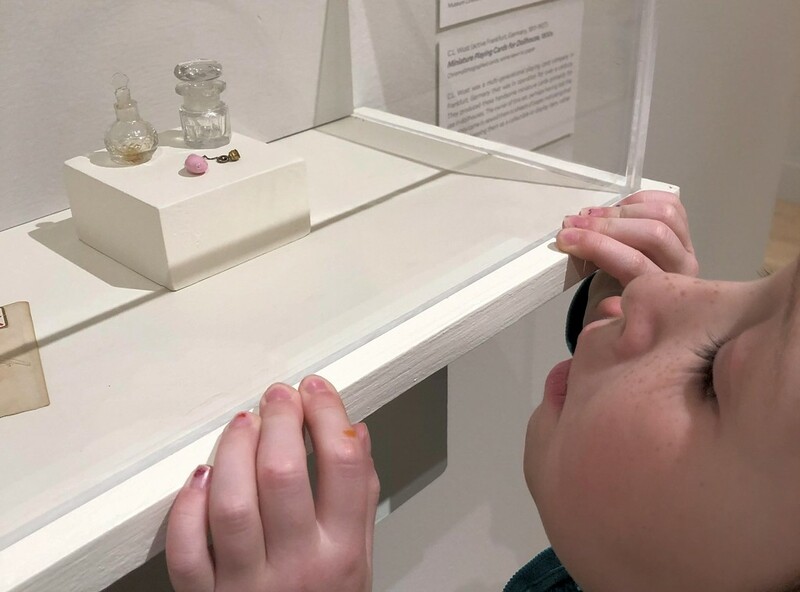 Destination Recreation: Small Worlds: Miniatures in Contemporary Art | Destination Recreation | Kids VT - small people, big ideas! Both of my children have long been obsessed with tiny toys. As a toddler, my son, now 10, carried around miniature ninja figures in his sticky fists. When he lost one — which happened daily — a crisis ensued, and we could not resume normal activities until his beloved Bok Choy Boy was found. My 6-year-old daughter is enamored with little figurines called Shopkins. She collects and trades them with her friends. "Mommy, looook! This one looks like a miniature toaster!" she squeals. "And it's soooo cute." Even I like Legos. Building ships, planes and imaginary worlds with them is something our entire family enjoys together. So you can imagine my excitement when I discovered there was a new exhibit at the University of Vermont's Fleming Museum of Art that highlights small worlds and miniature items. As an afterschool diversion from Fortnite, I took my kids, Henry and Ruby, on an adventure to the museum. Upon arrival, we briefly perused the permanent installations. Ruby enjoyed the tribal masks, and Henry was wowed by the samurai suit. We passed through a wide marble hall ("Whoa, Mom, this looks like a palace!") and found the current exhibit. Filled with photography, mini sculptures and hands-on fun, each piece offers an element of whimsy. Joe Fig's replica of an artist's studio had us all in awe. A tiny figure works at a desk in a dollhouse-sized room equipped with photographs for inspiration. A tiny drafting table is littered with even tinier cylinders filled with rulers and paint brushes. Thread-like wires connect to lightbulbs that hang from the ceiling. Close your eyes and you can imagine them illuminated at night while the artist works into the wee hours. Henry and Ruby loved the larger-than-life photographs of food by Minimiam, the name for collaborators Akiko Ida and Pierre Javelle. Upon close inspection, you can see that there's a small figurine standing on top of that glazed donut, playing golf with the sprinkles! 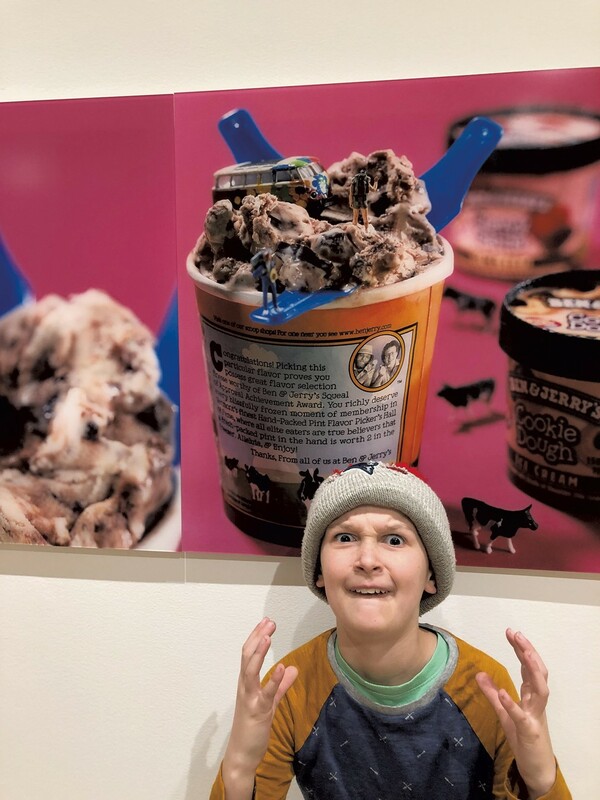 In another playful photograph, a hiker and a tiny toy van are intrepid explorers amidst the swirls of ice cream on a pint of Ben & Jerry's. Ruby and I were drawn in by the sparkle and bling of Sally Curcio, who creates snow-globe-like versions of cities using beads of different colors and shapes. Her gleaming turquoise lake surrounded by city buildings elicited "ooohs'' and "ahhhs" even from my eye-rolling tween. 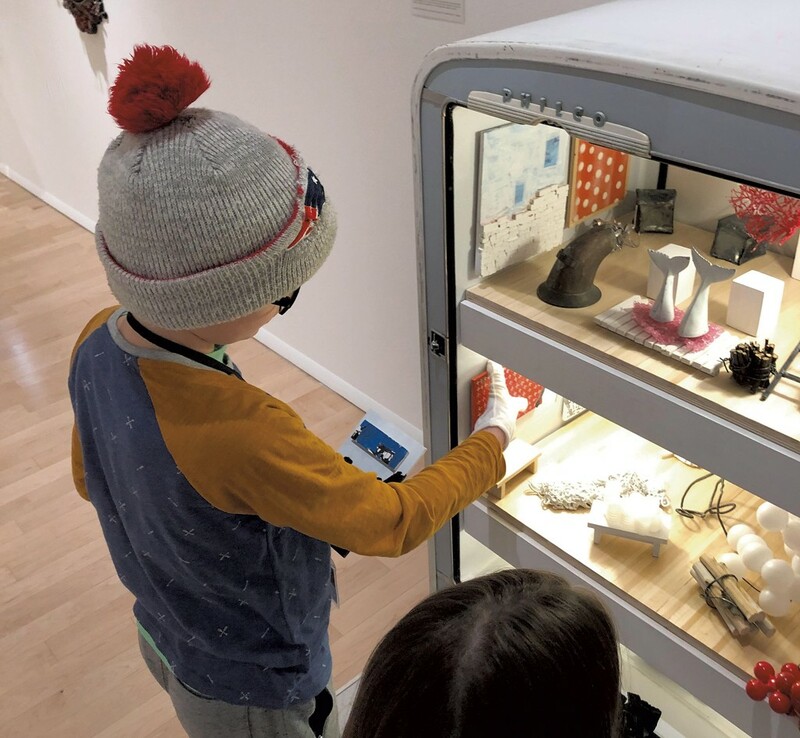 While most displays are labeled with the "Please do not touch" signs typically found in art museums, we were delighted to come upon two hands-on installations. Artist Brian D. Collier created The Collier Classification System for Very Small Objects and invites visitors to classify, name and contribute a very small object to his installation. We donated a piece of pocket lint we found in Ruby's jacket. Using Collier's system — which includes classifying the object into either a "once living" or "never living" category — contributors then use a key provided by Collier to name the very small object. Henry named the lint Nelifrag Pockeattachgrayspherisquisheunlik, put it in a small classification bottle and added it to the growing collection of candy wrappers, Tic Tacs and unidentifiable pieces of plastic. Around the corner, Matt Neckers' open vintage refrigerator is filled with furniture, a miniature sculpture of Jim Sardonis' famous whale tails and spherical piles of tiny ping pong balls. Visitors are allowed to move them around. Donning the badges and white gloves the museum provides, my kids rearranged the fridge to create their own tableau of oddities, like a ladder studded with tiny rockets and a mini coffee table piled high with small plastic tubes. Museum adventures can be eye-opening and enlightening, but also exhausting. Small Worlds offers just enough artistic exposure for short attention spans. Before you leave, head upstairs to check out the amazing mummy that's part of the museum's permanent collection. Then, reward your art hounds with an ice cream cone from the Dairy Bar at UVM's Davis Center, and you've got a day trip that's more than a little fun. Small Worlds: Miniatures in Contemporary Art runs through May 10. The Fleming is open Tuesday-Friday, 10 a.m.-4 p.m., Wednesday 10 a.m.-7 p.m. and Saturday and Sunday, noon-4 p.m. Admission is $10 per family, or $5 for adults and $3 for students and seniors. Children 6 and under are free.